After you’ve taken in Niagara’s magnificent waterfalls, head 20 minutes south to Buffalo, N.Y. to experience another nationally famous marvel — a hot, tasty mess, which has been attracting fans for nearly half a century. At The Anchor Bar on Main Street, the site where Buffalo’s claim to culinary fame was invented in 1964, you can taste the most authentic version of the red hot chicken snack known as the Buffalo wing. The original Buffalo wing recipe calls for covering meaty chicken wings in a spicy coating and baking them in a hot oven. The cooked wings are bathed in a mixture of melted butter and Louisiana-style hot sauce. To make it kid-friendly food, request the mild sauce. While the Anchor Bar is undisputedly Buffalo’s original wing establishment, many locals claim that the “sauciest” version of the Buffalo wing can be enjoyed at Duff’s Famous Wings. The original Duff’s is just north of Buffalo in Amherst. If you’re not up to a side trip from the Falls, check out the new location on Niagara Falls Boulevard to get your hands on this famous food. Start a sugar-coated adventure in Beantown by checking into the historic Omni Parker House Hotel. The site where Boston Cream Pie was invented in 1856, the property is across from Boston Common and is the only hotel on the 2.5-mile Freedom Trail. Families will appreciate easy walking access to the Boston Children’s Museum, Boston Public Garden and the Freedom Trail’s 16 historic sites, from The Old North Church to the U.S.S. Constitution Museum. After a day of exploration, enjoy a leisurely dinner at Parker’s, the Omni’s fine dining room, which is surprisingly kid-friendly. While you fill up on equally iconic clam chowder and house-invented specialties like Boston Schrod and Parker House Rolls, the kids can chow down on some of their favorites, from hot dogs to mini hamburgers. Of course, the reason you’re here is to sample the hotel’s namesake pastry creation. The original recipe stars a sponge cake base, which is filled with rich rum cream and crowned with chocolate ganache and toasted almonds. If the kids aren’t up to a formal meal, you can get miniature pies to go from the hotel coffee shop. In a city where voicing your opinion is considered to be a source of pride (as well as an urban survival skill), few debates are hotter than who makes the best pizza. First, there’s the question of what type of pizza (Thin Crust, Neapolitan or Sicilian?) is the tastiest. When it comes to who makes New York City‘s best pizza — well, fuggetaboutit! But even though it’s a food surrounded by debate, New York pizza is unquestionably one of the most famous foods in the US. Plus, when you’re traveling as a family, there are few more reliably kid-friendly foods than pizza. On Broadway, Sal & Carmine’s is a decidedly delicious dining space with quick service and cheap slices. Near Washington Square Park, Joe’s Pizza is a great spot to re-stoke a sightseer’s furnace. At Patsy’s Pizzeria in East Harlem, you can get a terrific thin crust slice for less than $2. Claiming to be the first to sell pizza by the slice, Patsy’s makes a mighty tasty traditional cheese pie, as well as a mean Margherita. For a quintessential New York experience, take the kids on a trek across the Brooklyn Bridge. At L&B Spumoni Gardens, you’ll be richly rewarded with thick Sicilian slices, refreshing spumoni and homemade Italian ice. In order to get a true taste of the competitive local sandwich scene, you’ll need to travel to South Philly near The Italian Market, where two of the city’s top cheesesteak purveyors, Pat’s King of Steaks and Geno’s Steaks, dish out signature sandwiches on opposite street corners. At both establishments, thinly sliced rib-eye steak is stuffed in a fresh-baked Italian roll, then topped with grilled onions and your choice of melted cheese (“Wiz,” American or Provolone). Both Pat’s and Geno’s are open 24 hours a day. However, to get your food fast and avoid holding up the line, it’s advisable to learn the local lingo — “wit or witout” — before placing your order for this famous food. While Pat’s and Geno’s get a lot of attention from tourists, however, locals will tell you Jim’s Steaks on South Street is the place to go. Tony Luke’s in South Philly serves up a good cheesesteak, too. Italian beef sandwiches and deep-dish pizza may warm the hearts of locals during Chicago‘s chilly winter season, but if you’re a first-time summer visitor to the Windy City, you should make a priority of widening your belt while sampling a hometown version of one of Chicago’s “hottest” famous foods. When it comes to the Chicago-style hot dog, one of the most popular places to take a bite is Portillo’s. In true Chicago form, Portillo’s starts with a Vienna beef hot dog, which is covered in a savory salad of traditional toppings, including mustard, relish, freshly chopped onions, peppers, sliced ripe tomatoes and a pickle, and then stuffed into a steamed poppy seed bun. While hot dogs are the ultimate kid-friendly food, they might not want all the toppings, so you may need to customize! For an even more authentic Chicago experience, visit Wrigley Field to enjoy the Chicago-style hot dogs while catching a ball game. Merely pronouncing the word “poutine” makes our mouths pucker. 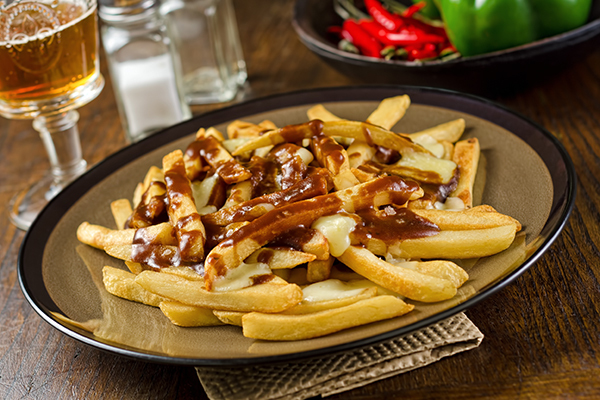 To the uninitiated, the French-Canadian fast food specialty in Quebec City, consisting of thick-cut French fries, cheese curds and homemade brown gravy, is a decidedly odd concoction. But step outside of your comfort zone and give poutine a try, and you’ll likely be pleased with your appetite-extending efforts. In Ontario, you can find poutine as far south as Toronto. But in order to get an authentic taste of the savory snack, what better spot to enjoy it than a French-speaking city? In Quebec City, there are a multitude of family-friendly poutine possibilities, from fast-food to fine dining. One well-known spot, Le Chic Shack, makes “souped-up” poutines featuring local cheeses and homemade sauces and serves them with homemade soda. Chez Ashton offers quick-prepared plain-Jane poutine and deep discounts when the mercury dips.